Apt Pupil. 1998. Directed by Bryan Singer. Screenplay by Brandon Boyce; based on the novella by Stephen King from the collection Different Seasons. Starring Ian McKellen, Brad Renfro, Joshua Jackson, Mickey Cottrell, Michael Reid MacKay, Ann Dowd, Bruce Davison, James Karen, Marjorie Lovett, David Cooley, Blake Anthony Tibbetts, Heather McComb, Katherine Malone, Grace Sinden, & David Schwimmer. Canal+/Phoenix Pictures/Bad Hat Harry Productions. Admittedly, I’m not a huge fan of Bryan Singer’s directing. Not that he’s bad. There’s something about his style that doesn’t always attract me. I’ve not seen his feature debut, though The Usual Suspects is a great film; slightly overrated, but great nonetheless. Sometimes I feel like Singer is a bit too focused on the look of things and forgets there needs to be proper substance. Apt Pupil suffers partly because of that disease. In a quest to get the atmosphere and the mood correctly dark, as well as unsettling, Singer works off the adapted screenplay from Brandon Boyce, which is the first problem. The original novella by Stephen King is an intense, tight little tale that unwinds into an absolute massacre, both figuratively and literally. Boyce does the source material a disservice by both watering down some of the more disturbing aspects, replacing that with weak storytelling. However, resting the weight of the movie on the shoulders of Ian McKellen and the 14-year-old Brad Renfro was a wise casting choice that ultimately transcends what mistakes were made in the writing. The film is nowhere near perfect, definitely not close to being as good the novella. Yet I dig it. With an eerie mood and a feeling of pure evil hovering around every last frame, Apt Pupil is a wonderful character study of two men at highly different points in their life: one is a former Nazi Sturmbannführer that worked in the concentration camps during World War II named Kurt Dussander (Ian McKellen), now living in California as Arthur Denker and hiding his identity nearing the end of his life; the other, a young high school student named Todd Bowden (Brad Renfro) on the verge of starting his life, ready to graduate, and harbouring a darkness within that desperately seems to want to get out. The juxtaposed scene of Dussander at dinner with everybody then hearing his various conversations playing through Todd’s head is perfect. First of all we see how the duality of these type of men, former Nazis, is part of their terror. Dussander moved from a life of hideous war crimes to one of a quiet neighbourhood old man, the kind who can sit with normal people and talk with them while leaving that other life somewhere behind him. Later on, Dussander starts to fall back into his old ways. This is where we see that whereas he’s able to hide his true identity so well there’s still only a very thin skin holding it inside. It all begins when Todd makes him put the SS costume on. Immediately we see the regression into that brainwashed state of marching, saluting, and this signals a change. Not long after Dussander tries to put a cat in his oven, though isn’t successful. Literally moving back to the ways of the concentration camp. There’s also a parallel between Dussander, his past, and the sinister intent of Todd. He is a little twisted; more so in the novella. But Renfro’s Todd is shown to be sick in his own way. One of the scenes that gets to me most is when Todd showers at school, then finds himself transported to the showers of Auschwitz, the frail and skinny bodies standing around him. There’s a very King feel here. Ripped straight from the pages of his writing almost. I also think the brief with the cat is great because it shows that lingering feeling in Dussander that wants to start killing again; the fact he attempts to put it in an oven is scarily perfect. I’m also a huge fan of that last moment set to “Das Ist Berlin” (performed by Liane Augustin & The Boheme Bar Trio) – without spoiling anything overtly there’s this powerful use of the look in Dussander’s eyes, the editing with Todd and his guidance counsellor/the basketball rim (that gives a feeling of sport; in that the young kid sees his actions as a form of play). That whole finishing scene really puts a cap on the visual elements, as one of the better executed sequences overall. This brings me to my biggest problem: the writing. I know the original novella is risky, it’s a touchy story to try adapting closely. But I can’t help feeling that to be honest to the prevalent themes you’ve really got to keep many of the elements King put into the plot. For instance – SPOILERS FOR BOOK READERS AHEAD! – instead of Dussander forcing Todd into the basement where the kid is in turn forced to kill the vagrant (played fabulously by Elias Koteas), in the story Todd kills homeless vagrants, and the story takes place over about four years, so there’s this really monstrous side to the kid that comes out even more than in this screenplay. Most of all it’s the brutality we’re missing. In a story already tackling the Holocaust and the obsession many develop with it, I’m not sure why Boyce didn’t try to retain a few of the more intense, savage pieces. I suppose because King doesn’t do much, first or last, to make Todd Bowden too sympathetic. The film goes too hard at trying to humanise both men, slightly, instead of showing the monster within each of them, one that grows in a symbiotic sense as Todd and Dussander go on similar yet separate paths. This film is due for a remake by a writer and director willing to go the full way. Singer’s effort captures a fascinating atmosphere, it contains two powerful performances that are worth EVERY second and every penny. Unfortunately there’s a lot lacking in comparison to what is a pleasantly shocking story by the master of horror, Mr. King. I’m not always a stickler for screenwriters keeping dead on with a novel or other source material. In this case the whole film would have been better served by circling more closely the original intentions of the author. Frankenstein’s Army. 2013. Directed by Richard Raaphorst. Screenplay by Miguel Tejada-Flores & Chris W. Mitchell from a story by Tejada-Flores & Raaphorst. Starring Robert Gwilym, Hon Ping Tang, Alexander Mercury, Luke Newberry, Joshua Sasse, Mark Stevenson, Andrei Zayats, Karel Roden, Klaus Lucas, Cristina Cataline, Jan de Lukowicz, & Zdenek Barinka. MDI Media Group/Dark Sky Films/Pellicola/XYZ Films/Sirena Film/Ministry of Culture of the Czech Republic/The Czech Film Industry Support Programme. ★★★★ There are no end to people sick of the found footage sub-genre, no matter how it’s used or in what genre it gets repurposed. I’m not one of them, though. For me, if a film can find a way to use found footage that’s at least a little fresh, unique in some way, then I’m really able to get into it. Frankenstein’s Army chooses to not only mash-up the horror and war genres, it further throws in some Mary Shelley DNA with a found footage setup. Honestly, even if it’s not your cup of tea in the end, this is at the very least an idea worth giving a chance. The film has a lot of creepy things going for it, as well as the fact so much of everything is done practically, using long takes that lend themselves to the found footage format. Director Richard Raaphorst tells an interesting story with an incredibly terrifying plot that never quits. While not everything works all of the time, Frankenstein’s Army is fairly well acted, and the monsters – oh, the monsters! Above all, the horrifying creatures are exactly one of the major reasons why this is effective. Plus, the feeling of a movie trying hard to do some unique monster work, especially through practical effects, is something we’re not often seeing these days. With a few things that could’ve been improved most of the movie is entertaining, as well as dark and definitely disturbing. On orders from Josef Stalin himself, near the end of World War II a group of Russian soldiers are sent on a mission for the Fatherland. Stalin specifically requests they film everything, so that it might make Russia proud. The troop end up hearing of a number of other soldiers in need of help. When the come across the caretaker of a church, the Russians are led into a terrifying house of horrors; a place where strange creatures lurk in every corner. But what starts as merely an isolated incidents devolves into the soldiers pushing through a massive German factory filled with awful monsters, pieced together from living flesh and metal, pieces of machinery, even propellers. When they discover the caretaker is really Dr. Viktor Frankenstein (Karel Roden), descendant of the original Dr. Frankenstein, the group of soldiers descend into what may as well be Hell. As the nastiness piles up, none of them are sure they’ll survive until the war is over – in fact, it’s just begun. After 4,200+ films and counting, a good chunk of those horror, I tend to believe not a whole lot truly scares me. Although, every so often there are things that creep me out, give me a few chills. I must say, there are a couple moments here where I found a creep or two. One scene is after Dmitri (Alexander Mercury) gets tossed down a chute by his fellow soldier, then a creature comes in and grabs a dead body nearby – right after, as Dmitri turns the camera I found that, plus several moments afterwards fairly unsettling. It didn’t shock me to the core, but the way it’s filmed is unsettling. Then once Dmitri goes further and ends up in an office, finding a teddy bear with a woman’s head sewn onto it, the whole thing goes from unsettling to disturbing (check the credits; you’ll find out who that woman-teddy bear is). I love this whole section because then we start getting into the Frankenstein aspect. And that’s another big reason why I enjoyed the screenplay. Because Frankenstein adaptations are a dime a dozen, or movies and stories that draw from Mary Shelley, such as ‘modern retellings’ and so on. Yet Frankenstein’s Army takes the legacy of the infamous doctor and extends it so that World War II, the Nazis and all they were up to, gets included. That opens up a whole new aspect to the story because the Nazis were into a lot of things experimentation-wise, from medical experiments to hopeful tries towards making ‘supermen’. The original Dr. Frankenstein may as well have gone on to be a Nazi doctor because his work was out of control as it was, attempting to essentially play God, which his supposed descendant here takes to an entirely new level of disturbed. Many found footage films suffer from a dearth of proper acting. Here, though, we get a main cast who do a fairly good job carrying the material. In addition, Dr. Viktor Frankenstein is played by the ever fabulous Karel Roden, whose talent gives the film an extra quality in the final 20 minutes. His exuberance is terrific, as Viktor starts out subtle then moves quickly into mania, with each minute getting wilder and wilder. Watching him walk around the factory explaining his process, talking of his family history and more, it is quite a treat. In the most morbid way possible. If it weren’t for the actor playing Dmitri and Roden as Frankenstein this wouldn’t have such an interesting finale. But really, the entire cast does a decent job, aside from the old German man that ends up with the soldiers for a short time, along with a boy (the kid wasn’t so bad). It’s not award-winning acting, however, it does the job. Again, the final half hour is a ton of fun, especially the last 19 minutes or so. Dmitri has to endure watching plenty of terror, a few patches of blood and guts, too. It is a grueling end, but packs a gruesome punch. I’ve got to give Frankenstein’s Army a 4-star rating. Yes, things could’ve been improved at certain points, perhaps some of the bits with the soldiers would do well with a tightening of the screenplay. But it is still one hell of an entertaining horror, bits and pieces of action thrown in and a heavy splash of science fiction. The genre mash-up, all captured in the found footage sub-genre, is spectacular and whereas some films try to do that then end up with too much this movie keeps its eye on the prize. Because really what it aims to be is a monster flick, a creature feature of sorts. Only the jumping-off point is WWII, Nazis, with that extra spice of Frankenstein stirred in. You can do much worse than this if looking for a weird horror to enjoy, or a found footage film. It at least employs the sub-genre in a different way than most of the ‘lost in the woods yelling’ or ‘trapped in a mental hospital yelling’ found footage efforts out there already. Give it a chance. Fury. 2014. Directed & Written by David Ayer. Starring Brad Pitt, Shia LaBeouf, Logan Lerman, Michael Peňa, Jon Bernthal, and Jim Parrack. David Ayer’s new thriller Fury is by far one of the most brutal and honest films set during the Second World War ever made. Not only does it present the agony of war, it also works as a great character piece. 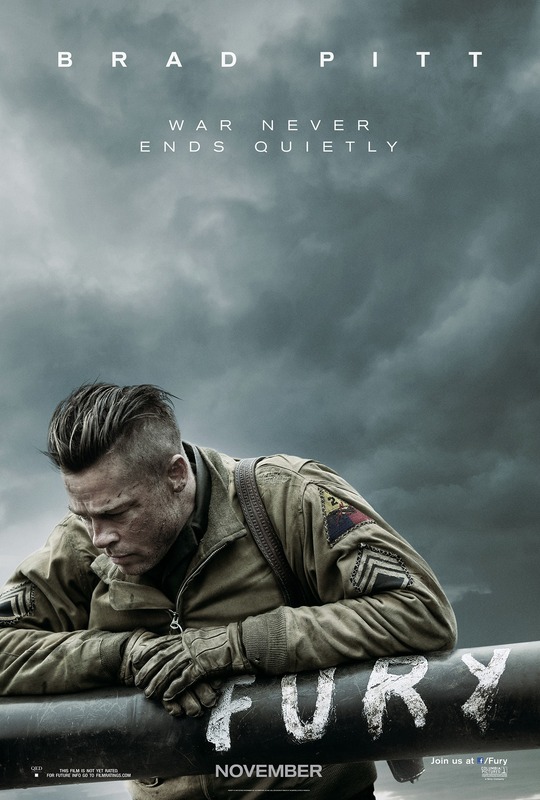 Brad Pitt leads the cast as Don ‘Wardaddy’ Collier, a sergeant who rides aboard the titular tank, Fury. Alongside him are his three most trusted men. However, after one of those men dies the crew is saddled with a fresh young army recruit (Lerman) hauled from desk duty to fight in the second Battalion. The five men continue through Germany together, killing every Nazi they find, and try to hold onto their humanity in the face of war and death. The film looks beautiful and everything feels very real (this also marks the first time an actual Tiger tank has been used on a movie set). Ayer shot with film instead of digitally, which gives Fury a very bleak, grim feeling as the tanks and the troops behind them trek through miles of mud. The way it’s filmed gives an almost nostalgic feel reminiscent of other great war pictures. No doubt there will be more than a few comparisons to the blockbuster Steven Spielberg film, Saving Private Ryan. Regardless of its predecessors, however, this film holds its own as one of the best World War II films out there. Fury is not delegated solely to bombs, bullets, and the horrific images of war. Ayer wonderfully crafts the film from its opening with a blurry shot of a figure on horseback. It moves slowly through an area where a fight has recently occurred. Bodies lay everywhere. Ashes and fire are all around. The figure, a German, comes into view riding a pale white horse: one of the Four Horsemen, symbolizing death. Wardaddy ambushes the man, killing him, and sends the horse on its way. For a moment he has driven death out. Later, we see the white horse again galloping away once more. When the film nears a close you begin to understand Ayer’s use of symbolism. Fury is mainly about what war does to those who engage in and are surrounded by it. It is a film about men trying to hold onto their humanity under the most gruelling conditions. One of the central struggles of the characters is their justification of death as preventing worse deaths for others. How does a man keep on being human even after holding a gun to another man’s head and pulling the trigger? And what if a man is forced to do that is worse? Ayer explores these dilemmas throughout the film with help of some stellar acting on all parts. Pitt earns his keep as a continually interesting actor. His portrayal of Wardaddy is fairly subtle and restrained. He looks and acts the part of a haunted war veteran. In solitary moments where the camera sticks on him Pitt conveys a side of war not often seen, as he fights with the emotion inside him trying to escape. The supporting cast is just as top notch. Shia LaBeouf proves capable of playing a quiet character instead of the usual loud cockiness he displays. Joe Bernthal, best known from AMC’s The Walking Dead and Michael Peňa who starred in Ayer’s earlier film End of Watch, are both in fine form playing men who have seen and done too much to simply return to normal after the war is over. However, it is Logan Lerman that really shines. 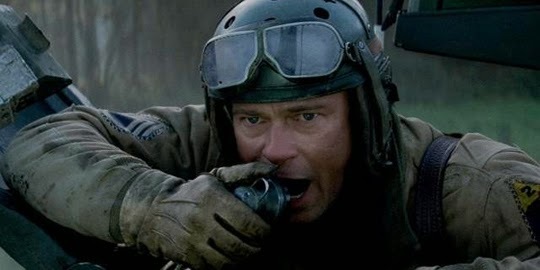 Playing the rookie soldier on the tank crew alongside Pitt, he displays great acting talent, and conveys the terror of many young men drafted and thrust into battle during World War II without ever having so much as fired a gun. Overall the main cast works together to depict the weary strain of war on those who’ve fought. I cannot recommend Fury enough. The cinematography is something to behold and really captures the grit of World War II’s muddy trenches. Honestly, for a dark look at war this movie is dripping with gorgeous shots. I love the camerawork. Certain shots here were just perfect. Ayer really set the tone with an overall atmosphere of tension. There was literal fog often rolling over the war fields, and it help to create the mood: a sense of dread hung over each scene. There are fairly divided opinions on both Shia LaBeouf and Brad Pitt, and depending on which side you fall it could skew how the movie plays, but I believe they each put in a fantastic performance here. This is a tightly scripted film driven by the emotional force of the actors. I’ve seen a review or two saying this movie was “so grim” and other such statements. One reviewer even claimed he felt like he “needed a hug” afterwards. I mean, there are so many things wrong with this way of thought. A movie, unless otherwise specified, is not meant to make you feel warm and fuzzy. Especially not one about the brutal nature of war, and during World War II no less. This is all about the grim picture. This is meant to make you feel unsettled and even a bit terrified, at least for the characters. I can never stand when people feel they have to like a character, or be made to feel good because of a character’s actions or by the plot – whatever. It’s all about whatever the character or plot is intended to do: final cause. This is the purpose of Fury – to unnerve you, displace your feelings and take you out of those comfort zones. Just as it must have felt for any of these men to be drafted and stuffed into a tank together. To be shoved out into the fields of some town in another country, on another continent. To be told you’re going to either live or die – there is no middle ground. So, in essence, Fury should really make you feel conflicted in certain ways, it should absolutely leave you with a grim feeling, and looking for hugs afterwards. If so, it has absolutely served its final purpose. There are countless war movies out there. What sets one apart from the pack is its honesty. Ayer pulls no punches about the realities of war from the script to the action sequences. Many war veterans often say that the real heroes never came home; Fury is a cinematic testament to this statement.